The stage is set for the greatest battle ever fought on the North American continent. Map Image: 30" x 23"
The map displays all the topography involved in the Gettysburg Campaign, from the winter camps around Fredericksburg to the Shenandoah Valley on into Maryland and Pennsylvania. The entire arena of Jeb Stuart's ride and other points east of Gettysburg, including Washington are also depicted. The map extends North to Harrisburg, Reading and Philadelphia. An inset map of the Gettysburg Battlefield (scale 1ï¿½" = 1mile) contributes to the comprehensiveness and usefulness of this map. Reverse Side: Copy describes Robert E. Lee and the Army of Northern Virginia operating in unfriendly and unfamiliar territory and makes clear that knowledge of topography is a crucial factor in war. 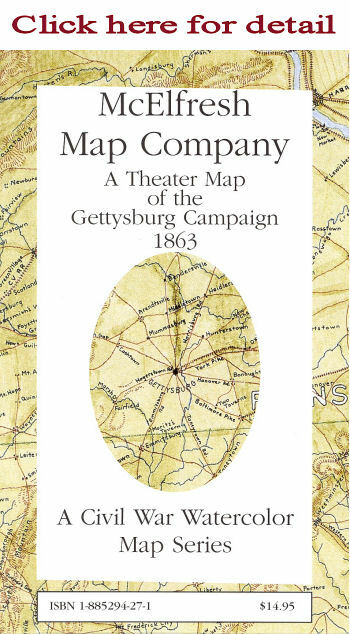 Images include a 22" by 15" full color reproduction of an Adams County maps that was used by both armies, a detail of the map used by Robert E. Lee throughout the campaign, and a contemporaneous route map prepared by Union engineers.